The third volume of Treasures of Irish Christianity was launched in Saint Patrick’s College, Maynooth, this afternoon. I have contributed two chapters to the latest volume in this series, edited by Salvador Ryan, Professor of Ecclesiastical History in Maynooth. One paper looks at Sir Richard Church (1784-1873), an Irish Anglican from Cork who became commander-in-chief of the Greek army during the war of independence in the early 19th century, and later became a life Senator in Greece. The second paper tells of the story of the Stewart family from Dublin who went to China with what is now the Dublin University Far Eastern Mission, and were martyred in 1895. Many of the contributors to this handsome and elegantly illustrated volume gathered in the Renehan Hall in Maynooth this afternoon for the launch of this new book, published by Veritas. But Salvador Ryan and Ciara Sherlock, Marketing Manager of Veritas told us the new book has already been put into the hands of Pope Francis in Rome. Father John-Paul Sheridan was in Rome last week with his ordination class to celebrate the 25th anniversary of their ordinations. 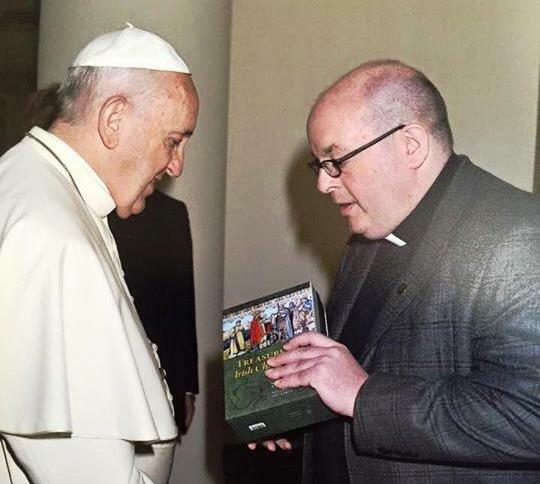 After Mass on Friday [26 June] in Casa Santa Marta, he presented Pope Francis with a box set of all three volumes of Treasures of Irish Christianity. Volume III was officially published today when it was launched in Maynooth by the former Minister for Education, Mary O’Rourke. This volume looks at ‘the Irish abroad’ from the earliest centuries to the present day, with a special emphasis on the historical contribution of Irish missionaries. The other topics include a retelling by Professor Raymond Gillespie of an account by the Revd Devereux Spratt, a 17th century Church of Ireland priest, of being captured by North African pirates; Father Michael Costelloe, the Galway-born priest who debated with the American abolitionist John Brown before his execution in 1859; an Irish Presbyterian missionary’s sermon that caused a whole social movement in 19th century New Zealand; the Brethren mission in China and the Dublin University Mission in Bengal; Irish military chaplains in World War I; and Father Hugh Sands, the missionary from Newry who met Mao Tse-tung. Treasures of Irish Christianity Volume III takes its cue from this year’s celebration of the 1,400th anniversary of the death of Saint Columbanus. It follows the successes of the previous volumes published in 2012 and 2013. Treasures of Irish Christianity People and Places, Images and Texts, also edited by Salvador Ryan and Brendan Leahy, was published as a contribution to the International Eucharistic Congress. 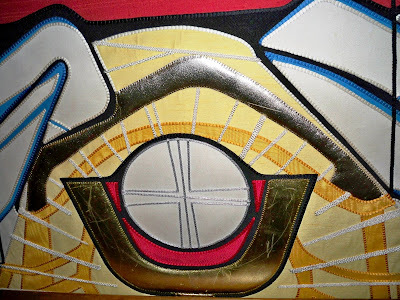 The Eucharist ... does the rector have to do everything? Lay Ministry trainees Dublin and Glendalough. Who writes the intercessions? The rector? Or the people leading the intercessions? Who listens to the prayers the people want to pray and need to pray? Part 2: Other services, including Baptisms, Confirmations, Marriages, Funerals. You will be surprised by the relationships you come across. ● Baptisms: p. 345 ff (especially p. 357 ff). ● Confirmation, p. 382 ff. ● Renewal of Baptismal vows, p. 398 ff. ● Funeral Services (pp 466 ff, especially pp 480 ff; see the notes on p. 480; A Form for the Burial of Ashes after Cremation, p. 501; The Funeral Service for a Child, p. 504; Prayers, p. 510; and a Form of use in the Home, Funeral Home or Mortuary, p. 514). Raymond Chapman, Hear Our Prayer: Gospel-based intercessions for Sundays, Holy Days and Festivals, Years A, B, & C (Norwich: Canterbury Press, 2003). Frank Colquhoun (ed), Parish Prayers (London: Hodder and Stoughton, 1967, 2005 ed). Frank Colquhoun (ed), New Parish Prayers (London: Hodder and Stoughton, 1982, 2005 ed). (Revd Canon Professor) Patrick Comerford is Lecturer in Anglicanism, Liturgy and Church History, the Church of Ireland Theological Institute. These notes were used at a half-day workshop, ‘An introduction to the liturgy,’ with Lay Ministry trainees in the Diocese of Dublin and Glendalough on 4 July 2015. The Collect we pray tomorrow [5 July 2015, the Fifth Sunday after Trinity], is for use throughout next week. It prays for the whole Church and for all faithful people, in our vocation and ministry, that we may serve God in holiness and truth. This morning we are talking about the whole Church, not simply the ministry of those who are ordained, but of all faithful people, and this prayer values the vocation and ministry of all, and affirms that ministry as serving God in holiness and truth. Our basic resource and workbook for these workshops is: The Book of Common Prayer (The Church of Ireland, 2004). They derive from the monastic offices, especially the cycle of daily prayer in the Benedictine tradition, and were adapted by Thomas Cranmer, Archbishop of Canterbury, and the Anglican reformers and their successors, bringing daily prayer out of the cloisters and into the daily life of parishes in the villages, towns and cities. It was their intention not that these offices should be the main Sunday service in our parishes, but that they should be said daily throughout the year (see The Book of Common Prayer 2004, p. 84). There are some parts of the service that are reserved for ordained priests – namely, pronouncing the words of absolution (see pp 86, 102) and the blessing (see p 116). But there is no provision for a blessing in the original form (see p. 100), and in the new format a blessing is only an option (see p. 116). Are there parts of Morning Prayer and Evening Prayer you should memorise? Are you familiar with the shortened forms of Daily Prayer for Weekdays (see pp 136-137), the simple structure for Daily Prayer (p. 138) and the Weekday intercessions for Monday to Saturday (pp 139-144)? The one service that many of you will be asked to lead is the Service of the Word (p. 165, followed by notes running to three pages, pp 166-168). Too often we take the outline (p. 165) as a rigid structure, rather than as scaffolding, and then wonder why the edifice crumbles around us. It is totally appropriate, for example, in a parish where a Service of the Word is the fall-back option every time there is a fifth Sunday in the month, for someone in lay ministry to take responsibility for organising that service, even though they do not have to lead it. In small groups, let us look at the notes on pp 166-168 and see what they say about what we can do? 11.30 a.m. 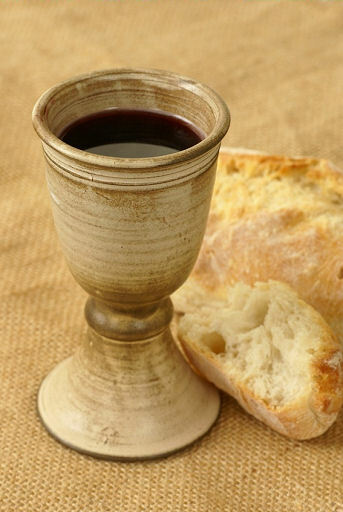 Session 2: The Eucharist/Holy Communion; other services, including Baptisms, Confirmations, Marriages, Funerals. Frank Colquhoun (ed), Contemporary Parish Prayers (London: Hodder and Stoughton, 195, 2005 ed).